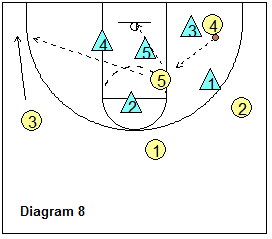 This zone play (for attacking the 2-3 zone) comes from Brad Brownell, Clemson University Head Coach, and his excellent DVD entitled "Gap Attack Zone Offense". The DVD has much more information on attacking the zone, and the play presented below is just a small sample, albeit a really good play. See the diagrams below. 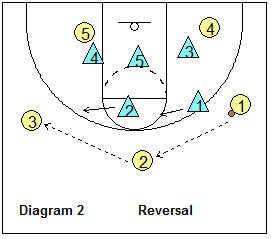 The defense is in a 2-3 zone. Diagram 1 shows O1 dribbling to the right wing, which helps distort the zone. O2 shallow cuts to the top. Now we reverse the ball with O1 passing to O2 and O2 passing to O3 (diagram 2). This is followed by a back-side double pinscreen with O1 and O4 back-screening the zone (diagram 3), while O2 flare cuts to the right wing. O3 skip-passes over to O2 (diagram 4). O1 goes back to the top. 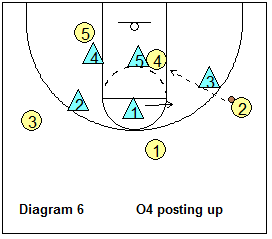 O4 has two options here (diagram 5)... if he/she is a big post player and can play with his back to the basket, he could find the middle low defender (X5), seal and post-up for the pass from O2 (diagram 6). Otherwise O4 moves to the short corner, while O5 flashes to the ball-side elbow (diagram 7). O2 could pass to either O4 or O5. 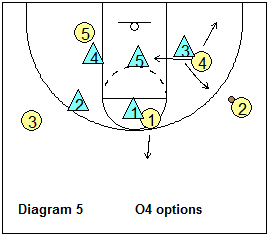 If the pass goes to O4 (diagram 8), O4 looks to score or pass to O5. 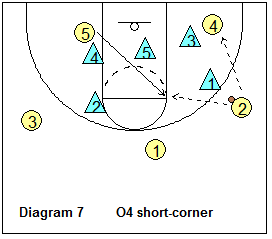 O5 could shoot, or look for O3 sliding down to the weakside corner. 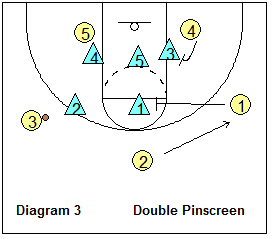 The could result in a wide-open 3-point shot. 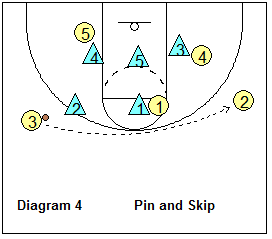 You can see that this play presents many excellent scoring opportunities. 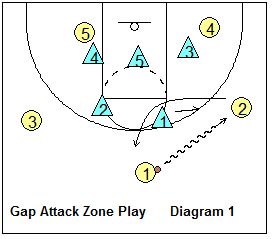 See Coach Brownell's DVD below to get the entire Gap Attack Zone Offense. 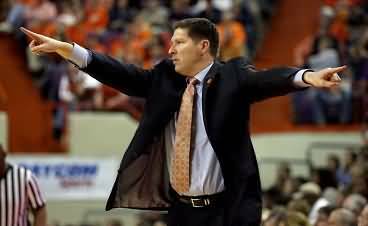 with Brad Brownell, Clemson University Head Coach; former Wright State University Head Coach.